In what feels like a very long time, it’s been a whole two years since the last ‘Assassin’s Creed’ game came out. Ubisoft got into the habit of releasing lots of the same franchise in a short space of time and, despite the excitement that came with it, I think we all started to feel the same thing – that there was no ingenuity left. 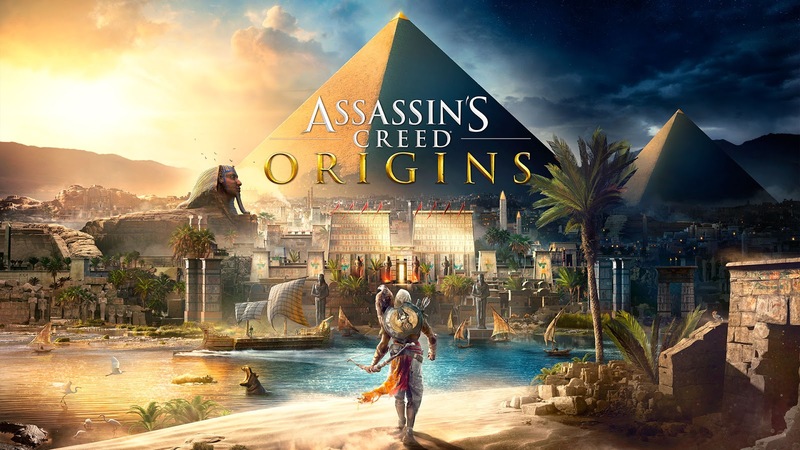 ‘Assassin’s Creed: Origins’ is the newest installment, and now the development team have used the time to actually come up with something new it feels like a breath of fresh air. This time round Ubisoft have gone completely back to the drawing board, which is apparent in all features of the game. As far as the story is concerned this is now an origins story of the Brotherhood of the Assassins and their fight against the Templars. You play as Bayek, an Egyptian who is considered the last Medjay. After being wronged by a group of shadowy figures he focuses all his strength on getting revenge. The story itself is very good and contains some really good voice-acting, although unfortunately, the voices themselves seemed muffled and hard to hear during the cutscenes due to loud music and sound effects taking over (I needed subtitles on to understand what was going on). These cutscenes are so well directed though, but really they’re just a backdrop for the world that has been created – you could probably play the entire game without a story and still really enjoy it. ‘Assassin’s Creed’ worlds have always been stunning (I remember being blown away by the first one as it was unlike any world I’d ever seen at that point) and this one really gives further games something to live up to. I’ve got quite used to vibrant, bustling streets of old in the series, and so the arid, sloped deserts that seem to go on forever make quite a nice change. You can tell Ubisoft are proud of their newest creation (and rightly so) as the game now features photo mode, like several other games that have come out recently. Visuals are important for me, so I love having this option in a game (even if it does mean I spend 90% of my time taking photos rather than completing the story). There’s a much stronger RPG feel this time round, moving away from the typical action-adventure style of before. The map is massive, and split up into several areas crammed with side-quests and activities. Perhaps it’s too large – at points it felt overwhelming (as many ‘Assassin’s Creed’ games have done) and could have done with a little more direction. It’s now level-based as well, and you’ll certainly struggle if you enter the higher level areas prematurely. They’ve also added a loot system (yay!) akin to ‘Witcher 3’, where you can find coloured loot based on rarity ranging from common to legendary. The system itself is excellent, but there’s no looted armour apart from shields – outfits can be bought but they’re purely cosmetic, so I feel like Ubisoft could have gone further with this to add some more complexity. Fighting is also completely different to previous games and doesn’t feel quite so watered down anymore. It plays a lot more like For Honor (Ubisoft again) and is much more tactical, requiring you to attack, parry, defend, and dodge. Perfect timing is crucial for some moves, and it just feels a lot more improved. One nice little throwback to ‘Black Flag’ (my personal favourite) is the hunting skill, which is used for upgrades on armour and weapons. It’s very streamlined, but felt tacked on rather than integrated with the gameplay. Thankfully the days of faces in the fireplace are gone, with very little in the way of glitches and bugs. Ubisoft have really taken their time with this one and it shows in quality of gameplay. If I’m honest the franchise really needed the two-year break, but now ‘Origins’ has come back to being one of the best ‘Assassin’s Creed’ games to date, and I’m excited to see what could come next.